Rockridge and East Oakland denizens "meet" in A Hole in Space (Oakland Redux). Bert Johnson A Hole in Space (Oakland Redux) aims to connect Oakland neighbors across the city. Go to AHoleInSpace.com for updates on screenings. Artist Ellen Sebastian Chang satirically suggested in an interview: "Let's just kill and taxidermy all of the artists, people of color, and low-income people, and make the whole Bay Area into a diorama where people can come and feel safe." She was commenting on a recent guided tour of Market Hall in Oakland's Rockridge neighborhood and reflecting on the plethora of similar tours throughout the East Bay, where she has lived since 1970. "I call it the Motel 6-ing of culture," she said. At a Motel 6, no matter where you are, you'll never be surprised, because each location is exactly the same — and that's the intention. 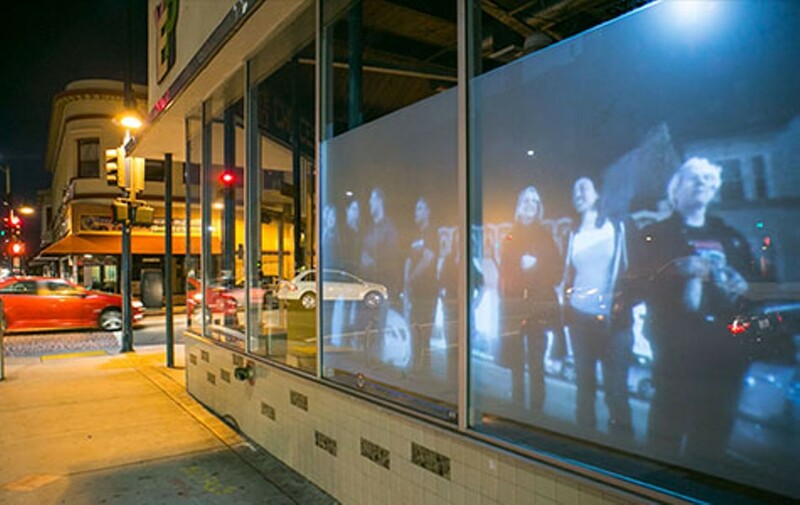 Chang had been in Rockridge with collaborator Maya Gurantz (who has also lived in Oakland for many years) to install a public art piece called A Hole in Space (Oakland Redux), which created a video chat-like portal between Cole Hardware on College Avenue in Rockridge and Youth Employment Partnership in East Oakland by projecting a screen onto the street-front windows of each and installing mics and speakers. Unlike the minds behind Motel 6, their intention was to intervene in the expected environments of each location by collapsing the distance between them. The installation, which went live every night from January 19 through 25, was a reiteration of Kit Galloway and Sherrie Rabinowitz's famous 1980 piece, A Hole in Space. The artists used satellite technology to set up a life-sized video chat between two sites on busy streets in Los Angeles and New York City — at a time when even cellphones were uncommon. Upon encountering their counterparts on the opposite coast, pedestrians were bursting with awe and excitement. Loved ones who hadn't seen each other in years were planning meetings at the digital site. After three hours, spread out over three nights, the crowd grew so large that the piece was shut down. Reflecting on the work in the audio guide for the 2008 SFMOMA exhibit The Art of Participation: 1950 to Now, Galloway explains that their intention was to democratize communication streams for a moment in order to inspire people to creatively reclaim technology from "the tyranny of broadcast and traditional media." Confronted with the wonder of the piece, participants "would then become, in their imaginations, the architect of a new future, they might begin to define what they want as an information environment rather than be consumers of it." In Chang and Gurantz's rendition of the piece, the premise was turned on its head. Rather than connecting sites across the continent, they chose to connect two neighborhoods that are just a short drive away from each other, yet worlds apart in another sense. Harkening back to the technological utopianism of the 1980s, their reinterpretation asks: Where have we arrived? The implied answer is that we've come to a point where we regularly interact with people across the globe, but frequently ignore those who are right around us, buffered by increasing racial and economic segregation that allows for erasure of difference. It has happened all over, but especially in Oakland. Gurantz and Chang argue that the common contemporary American lifestyle is hyper-curated and hyper-informed, leaving no room for variance or surprise. Yelp helps us avoid restaurants at which we don't want to eat, and Tinder helps us easily screen out people we aren't attracted to. We're able to filter everything we don't already know we like, and most people have fallen into the comfort of that artificial homogeny. The initial 1980 installation was such a sensation in part because the artists provided no announcement or explanation, and Chang and Gurantz hoped to do the same. But soon after installing it, they found complaints on both sides of the portal. 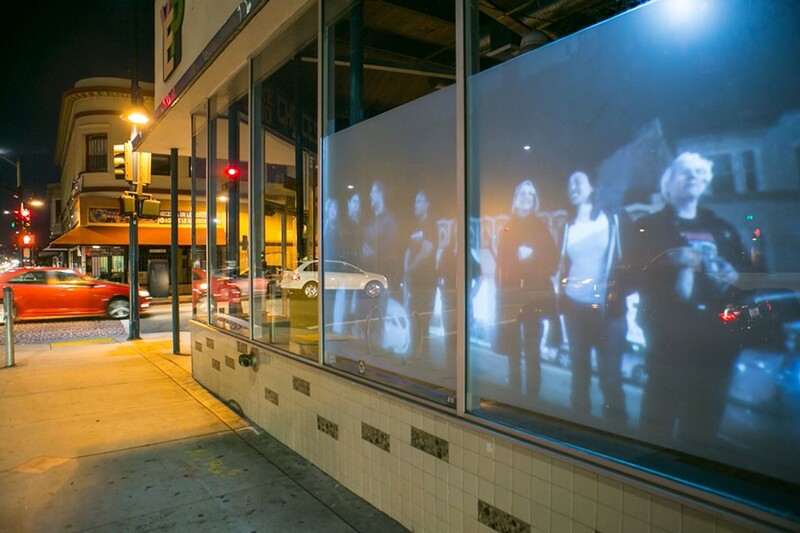 Cranky Rockridge residents were bothered by the unexplained noise, and pedestrians in East Oakland were wary of the increased surveillance (an issue that the artists identify with, and pre-emptively struggled with when planning the piece). It was clear that the technological optimism of the 1980s was gone, and had been replaced — for varying reasons — by a fear of the unknown. The artists anticipated that many would be pushed out of their comfort zones through their interactions with the piece, and that was all part of the plan. (They both have rich backgrounds in immersive theater). But by the second day, they caved in and posted an artist statement at each site to calm audience's anxieties. They also printed simple cards for workers at each location to give to those curious enough to inquire within. "This is not surveillance," "See without judgment," and, "Say hello to your neighbor," are some of the brief explanations that they offered, along with an email address. They hoped these nudges would help participants acknowledge others who share their city. Their higher goal is to "re-inscribe civic sharing," and remind people to take responsibility for one another. But on a basic level, they simply hope to connect strangers who are avoiding each other, perhaps unknowingly. As I stood at night on the East Oakland side, watching the passersby in Rockridge, a young Caucasian girl stopped, pulling her father's hand as she turned to the screen. I waved at her as she investigated the scene, wide-eyed and bewildered. She waved back. I doubt she's ever been to East Oakland. As for the rest of the interactions that took place through the portal, diners at FuseBOX in West Oakland (which Chang co-owns) may have seen them through a live, side-by-side feed that played in the restaurant throughout the week. The artists also plan to go through the footage and edit it into a reel of highlights that will be projected on The Great Wall of Oakland — the side of a building on West Grand Avenue and Valley Street that sometimes serves as a public video-art work venue — and likely elsewhere. The date has not been set. But the resulting film will only serve as documentation of the ephemeral artwork. Gurantz asserted that the true site of the piece was within the interactions of those who encountered each other through it. As Chang put it, "The piece will be successful to me if one person in Rockridge has one real conversation with one person in East Oakland and it's done out of a place of curiosity and respect and a sense of real wonder."